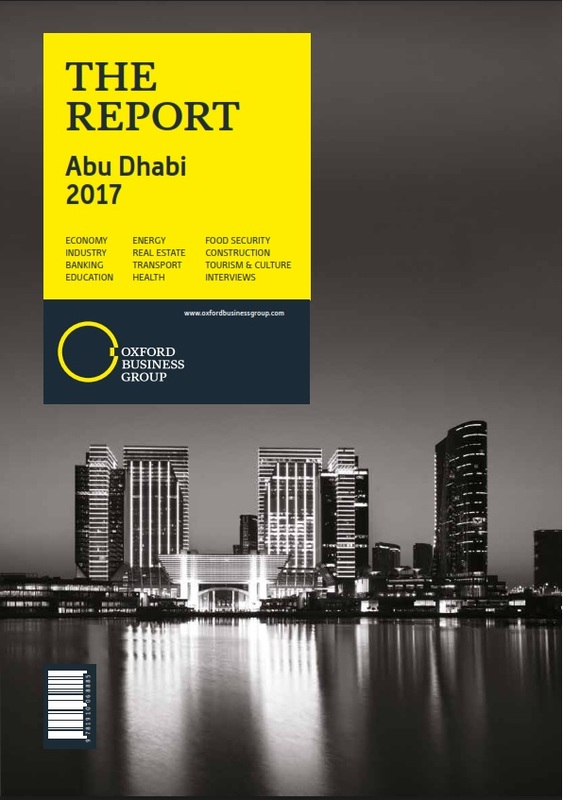 Abu Dhabi: A new report just produced by the global research and consultancy firm Oxford Business Group (OBG) provides a sweeping overview of Abu Dhabi’s investment climate in light of continued lower commodities prices throughout 2016 and 2017. The Report: Abu Dhabi 2017 provides detailed coverage of the local government’s development targets following the release of the emirate’s new 5-year plan, with a special focus on landmark mergers and consolidations seen over the last year across sovereign funds, energy, banking, and education. OBG’s 11th economic report on Abu Dhabi also tracks the ongoing drive towards economic diversification, where key investments like Abu Dhabi Global Market and Cleveland Clinic Abu Dhabi continue to boost the emirate’s regional influence in areas like financial services and healthcare. Improving connectivity remains a key focus for the emirate , with ongoing work around Abu Dhabi International Airport’s Midfield Terminal Building (MTB) and expansion at Khalifa Port being assessed in the 2017 report. Additionally, The Report: Abu Dhabi 2017 charts the emirate’s efforts to broaden its tourism industry, by augmenting the business travel and leisure segments with a new range of offerings that encompass niches such as culture. The report plots new projects under development, including initiatives on Yas and Saadiyat islands, as well as in Al Ain, which are designed to appeal to both cultural tourists and visitors looking for recreational facilities. The latest developments in Abu Dhabi’s energy sector are also examined, including the emirate’s decision to sharpen its focus on downstream activities, optimise costs across the value chain, and seal new agreements with global partners. Major projects in the renewable energy space, including the region’s first civilian nuclear programme and major solar investments, will be analysed in full. The Report: Abu Dhabi 2017 contains exclusive commentary from His Highness Sheikh Hazza bin Zayed Al Nahyan, vice-chairman of the Abu Dhabi Executive Council, together with a detailed, sector-by-sector analysis for investors. It also features comment from other high-profile figures across a number of key sectors, including: Theresa May, Prime Minister of the United Kingdom, H.E. Khaldoon Al Mubarak, CEO and Managing Director of Mubadala Investment Company; H.E. Awaidha Al Marar, Chairman of the Department of Municipal Affairs and Transport H.E. Dr. Sultan Al Jaber, UAE minister of state and CEO, Abu Dhabi National Oil Company; H.E. Khalifa Al Kindi, Chairman of the Central Bank of the UAE; H.E. Dr. Abdullah Belhaif Al Nuaimi, Minister of Infrastructure Development; and H.E. Capt. Mohamed Juma Al Shamisi, CEO, Abu Dhabi Ports. Oliver Cornock, OBG’s Editor-in-Chief, said investors have welcomed the government’s 2016 update on its development strategy, which has provided greater clarity on the next phase of its ambitious plans for the emirate. OBG’s Regional Director, Michelle Solomon, agreed that the Group’s research pointed to myriad openings for investors, particularly as government spending continues to pick up and as the private sector’s contribution to the economy continues to increase. The Report: Abu Dhabi 2017 marks the culmination of a year of field research by OBG’s analysts. The report assesses trends and developments across the economy, including those in macroeconomics, infrastructure, banking and others. The Report: Abu Dhabi 2017 is available in online and print. The Report: Abu Dhabi 2017 has been produced with Abu Dhabi Islamic Bank, PwC and ReedSmith. Oxford Business Group is a global research and consultancy company with a presence in over 35 countries, from the Middle East, Asia and Africa to the Americas. A distinctive and respected provider of on-the-ground intelligence on many of the world’s fastest growing markets, OBG has offices in London, Berlin, Dubai and Istanbul, and a network of local bureaus across the countries in which we operate. The Report: Abu Dhabi 2017 has been produced with Abu Dhabi Islamic Bank, PwC and ReedSmith. Through its range of products, OBG offers comprehensive and accurate analysis of macroeconomic and sectoral developments, including banking, capital markets, tourism, energy, transport, industry and ICT. OBG provides business intelligence to its subscribers through multiple platforms: Economic News and Views, OBG Business Barometer – CEO Survey, Roundtables and Conferences, Global Platform – exclusive video interviews, The Report publications and Consultancy division. OBG reports are now available on the Bloomberg Terminal and Thomson Reuters Eikon.